One day, Ushio Aotsuki, a middle school student and the son of a temple keeper, discovers a basement hidden in his family’s shrine. He unknowingly releases demonic energy that attracts thousands of monsters, all hungry for human flesh. The demon imprisoned in the basement, Tora, makes an offer: He will help fight the monsters if Ushio removes the legendary Beast Spear that has kept him trapped in the basement for 500 years. Can Ushio trust Tora to keep his word? Ushio finds someone imprisoned in the basement of his family’s shrine and accidentally releases its aura, attracting thousands of monsters. Tora starts following Ushio to school. Meanwhile, Asako, Mayuko, and the girls of the library club are attacked by a stone monster in the old school building. Ushio meets the daughter of a painter he admires, and he’s determined to have her model for him. However, it seems like accidents await anyone who dares to come close to her. Workers accidentally release a family of malicious demons bent on revenge against the woman who trapped them, and Ushio’s friend, Inoue, looks just like her. A powerful exorcist from China comes to Japan seeking the monster that murdered his wife and child, and he’s convinced that Tora is the yokai he seeks. An ancient ocean spirit asks Tora to help destroy a powerful serpent demon. When Tora gets eaten, he does the unthinkable: ask Ushio for help. After learning his mom might still be alive, Ushio presses his father for information. Meanwhile, Ushio’s father is given the order to kill Tora and reclaim the Beast Spear. Ushio and Tora’s plane to Hokkaido is attacked by a yokai who hunts and devours humans in the sky. After an intense fight, it looks like not even Tora can defeat it! Juurou, a yokai driven mad by the construction near his family’s home, goes on a killing spree. His siblings approach Ushio and beg him to kill their brother. The Takatori family has kept the yokai, Omamori, captive for years to ensure their prosperity. Saya, the white-haired girl who cares for her, needs Ushio’s help to free her. While staying with the kataimachi, Ushio sees a vision of Asako and Mayuko getting attacked by a mirror demon with a perverse preference for young women. On the road to uncovering the truth about his mother, Ushio is attacked by a massive hoard of demons, all hell-bent on ripping him apart. Staring down the jaws of imminent death, Ushio prepares himself for the worst. His enemies are strong, but are his allies, those whose lives he’s changed, stronger? Ushio is intercepted by a young woman, one of four who’ve been trained to inherit the Beast Spear. Faced with the truth, will Ushio hand over the spear to its rightful owner? Nagare comes to terms with Ushio as the wielder of the spear, but the tension rises as Moritsuna, the most favored and most powerful successor of the Beast Spear, arrives. Against the advice of everyone around him, Ushio decides to use the Beast Spear to enter a human’s body, determined to fight off the yokai possessing Moritsuna. As Ushio loses more of his soul to the spear, the spirit of the Kohamei Sect founder offers the only solution to stop his rampage: gather the girls whose lives he’s saved. Tora and the girls continue their efforts to restore Ushio. As the situation intensifies around them, Ushio’s life, and everyone else’s, falls on Asako’s shoulders. A monster inside the cave transports Ushio and Tora to Ancient China where Ushio meets a young Jie Mei, the sister of the Beast Spear’s creator. Ushio, Jie Mei, and Giryo are deeply shaken after the tragic encounter with Hakumen no Mono, and Ushio’s despair only deepens as the true nature of the spear comes to light. Ushio’s peaceful homecoming is broken when the fourth successor, Kirio, appears. Meanwhile, an avatar of Hakumen no Mono attacks the main temple of the Kohamei Sect. Kirio leads a surprise attack on Ushio and succeeds in taking the Beast Spear. A raid on Kirio’s hideout reveals the mysterious circumstances of his birth. With Nagare and Hinowa in the clutches of a monster, Tora busy, and the Beast Spear on the verge of destruction, is Ushio strong enough to fight Kirio and his “mother” alone? Tora decides to haunt Mayuko for the day, but the quiet afternoon is shattered when she’s lured into a trap at a shopping center! Ushio and Tora are targeted by a group of scientists, and Asako gets caught in the crossfire! What dark secrets await in a lab that studies yokai? Shigure and the JSDF close in on in the lab. Meanwhile, Ushio and Tora fight to rescue Bal, and Asako works with the H.A.M.M.R. scientists to restrain the synthetic Hakumen. Ushio is devastated when he discovers that no one, not even Asako, knows who he is. With everyone’s memories erased, can Ushio hope that Tora remembers him? Jie Mei’s spirit appears and appeals to the yokai to spare Mayuko’s life. 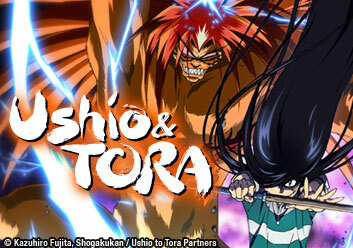 With both of their lives on the line, can Ushio and Tora make it in time to stop their plans? Ushio’s surprise meeting with Hyou is interrupted by a pack of yokai that look similar to Tora. Where do their loyalties lie, and why does Hyou know of their origin? A shocking betrayal from one of Ushio’s closest allies is followed by a summons from the surviving H.A.M.M.R. scientists. Can their gift to him change the tide of battle? Ushio and Tora rush to save his mother, but they’re intercepted by Nagare. As Nagare and Tora face off, Ushio attempts to persuade the JSDF to call off the attack. At the stone pillar beneath the sea, Ushio prepares himself to finally meet his mother. Meanwhile, the yokai of the East and West clash as the JSDF launches their attack. As Hakumen writhes out of the sea, Ushio's fear turns into despair and hatred. As the battle begins against the dreaded creature, Ushio loses his mind to the spear. Ushio has a dream about a child born on the night a star destroyed an ancient village. As this cursed child grows into a terrifying man, Ushio realizes Hakumen’s origin. The pieces of the Beast Spear, resonating with the hope in Ushio’s soul, restore his memory to the people who’ve forgotten him. Meanwhile, Tora squares off against Hakumen. Humans and yokai unite behind Ushio to fight Hakumen at sea, while Saya opens the gates to the underworld for help. Meanwhile, Hyou faces Guren in a fight to the death. Mayuko goes to revive Tora as he lies heavily wounded in the ocean with a hole in his chest. Are Mayuko’s affections enough to bring him back to the battle? The humans join the fight at sea, but Hakumen releases a toxic gas, trapping Ushio and Tora. Inside, the two find themselves at the mercy of Hakumen’s most dangerous form. Hakumen, the embodiment of all darkness, fights against the light. As Hakumen, driven mad with hatred, hunts down the spear, Ushio and Tora make an impossible choice.